High-Intensity Interval Training (HIIT) is a prominent trend in fitness training. Even if a fitness class or training program doesn’t explicitly market itself as HIIT, most boot camps and exercise classes incorporate HIIT components. Because it is such a popular workout model, we wanted to answer frequently asked questions about HIIT workouts so that you can learn all the hard-HIITing facts you need to start this type of training. Question: What exactly is HIIT personal training? 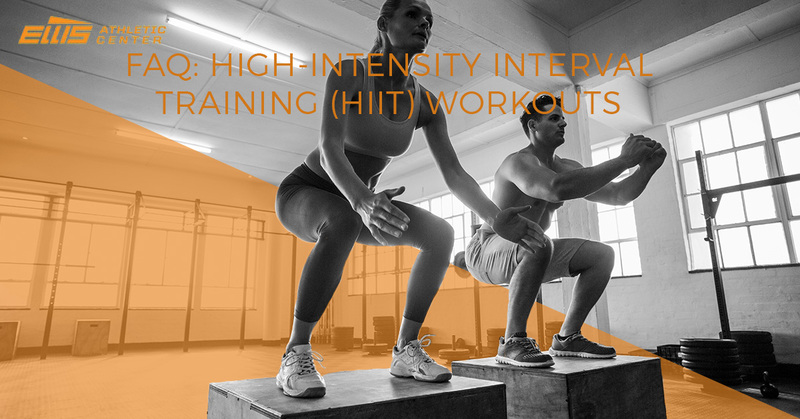 Knowing what the acronym stands for (high-intensity interval training) doesn’t necessarily demystify HIIT any further. In its most basic form, HIIT exercises follow this pattern: workout really hard for a short period of time, between 30 seconds and a few minutes, and then rest. Rinse — or wipe off sweat, in this case — and repeat and you have a full HIIT class. Indeed, “intervals” refers to these periods of exertion and rest. One of the most attractive parts about HIIT training is that you can incorporate all sorts of different exercises. There is no set sequence that you must follow, so you can keep HIIT classes fresh and geared specifically toward your fitness goals. At Ellis Athletic Club, many of our personal training sessions and group fitness classes follow a HIIT structure. Question: Why is HIIT better than other forms of exercise? Increase your metabolism: After this type of training, your metabolism can get a boost for up to two days! Your hard work during HIIT means you continue to burn fat hours later. This is referred to as “afterburn” or “excess post-exercise oxygen consumption” (EPOC). Decrease fat: Afterburn contributes to your body burning a lot of fat. If you have weight loss goals, HIIT is particularly worth considering. Gain muscle mass: What’s better than losing fat? Gaining muscle in its place! HIIT incorporates strength and bodyweight training, so your body increases its muscle mass while it burns fat. Question: What makes HIIT good for personal training? HIIT is such a great all-around workout because it keeps your heart rate elevated through the entire regimen. Even during rest, you are active and working to produce more oxygen. When it comes to personal training, HIIT is a favorite because it allows you to maximize the time you have in the gym. Even though it involves “rest,” you’ll see as soon as you complete your first HIIT exercise that this isn’t necessarily the right word. Think of it as active rest and recovery; your body working to prepare for the next active interval. Personal training also tends to incorporate HIIT because it is much easier to do when someone else is keeping track of the time, number of reps, and designs the interval sequence to perfectly suit your level of fitness. Not all personal training involves HIIT, as you might be focusing more on cardiovascular stamina or proper form, but it is a well-suited for personal training sessions. The next time you are at the gym or sign up for personal training, ask more about HIIT! Question: Are there any concerns related to HIIT? As with any form of exercise, you want to make sure you have medical clearance and a safe foundation. According to researchers at the University of British Columbia, HIIT might cause undue stress on participants who do not already exercise. If you fall into this category, consider personal training sessions instead so that you work with a trained expert. In a fitness training session, your coach should assess your fitness, mechanics, and recommend the right exercises for you. If you want to learn more about HIIT or living an active lifestyle, contact the fitness team at Ellis Athletic Center. We offer a range of small group exercise classes, HIIT workout classes, state-of-the-art facilities, and personal training in Newtown Square. Visit today or learn more about our membership online!